“When it comes to landscaping, sometimes ‘awesome’ isn’t accomplished in one season — let alone, overnight,” says Deck and Patio’s Dave Stockwell. 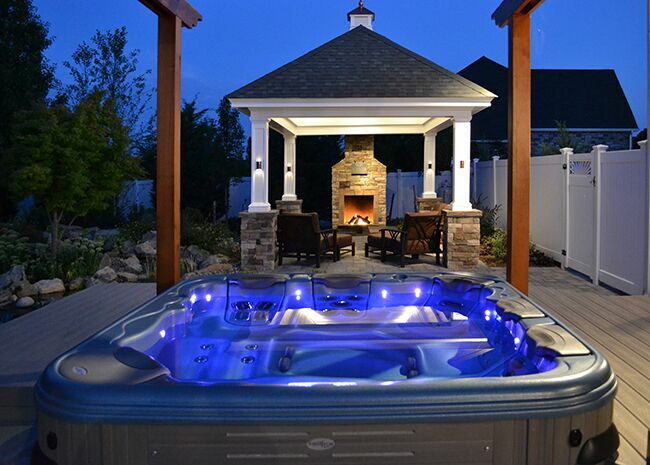 — and a special hot tub installation with custom open-top pergola. To complete it, required a healthy budget and building time. So our design team came up with a thorough plan that could be built in phases. In the first phase we built them their new Trex deck (Gravel Path boards) as well as a custom pergola to surround their new Bullfrog Spa. For easy daily access, Deck and Patio positioned the hot tub immediately outside their back door, tucked into the deck. 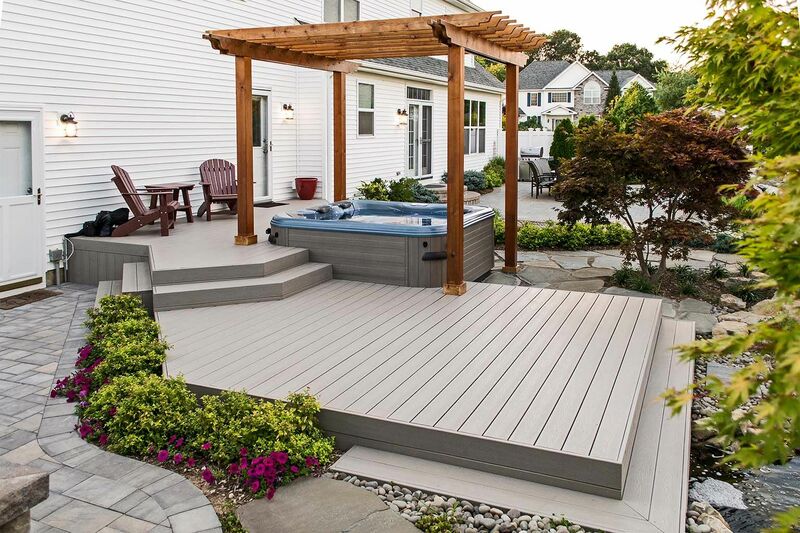 Plus, we designed the deck with a raised tier which makes getting in the spa effortless. They just have to sit on its edge and swing their legs over. In addition, the deck layout allowed for two adjacent lounging areas for when our clients take breaks from the spa. Our team constructed a custom pergola. Through its elegant definition of space, it provides drama and architectural interest around the hot tub. The clients also wanted an outdoor great room that could be used most of the year. The answer was a handsome shingled roof pavilion with white columns, which also boasts a fireplace for warmth in autumn and winter months. The bases of the columns are faced with the same stone as the fireplace. “It also offers additional ambience while they’e in their hot tub,” adds Dave. 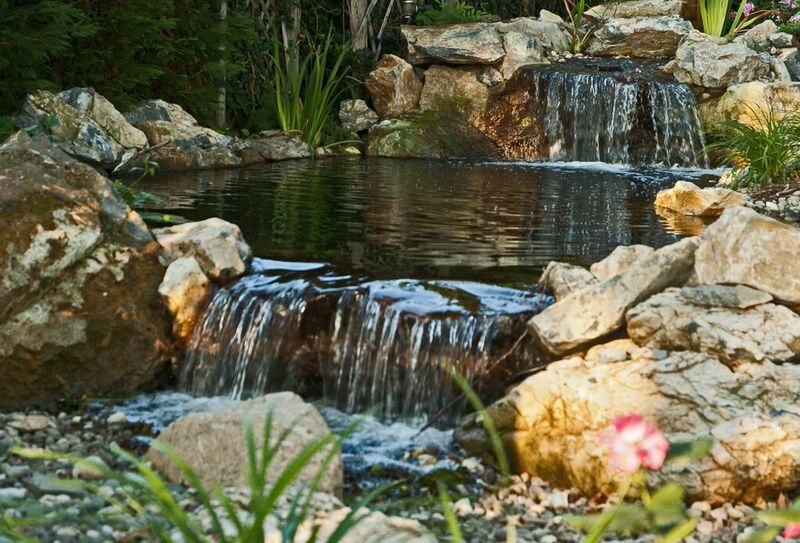 There is no question that backyard water features can add the ‘awesome’ to any retreat. 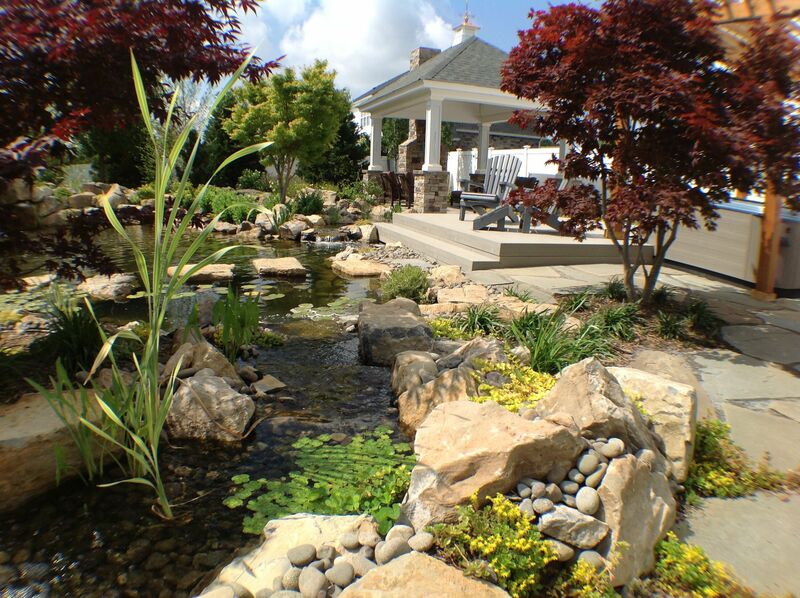 And these homeowners wanted to enjoy waterfalls and ponds from their spa, as well as the deck, patios, and every area of their yard. When Deck and patio built this complete water feature, there was room in the larger swimming pond (right) to add a sizable stone island. With smooth natural stones leading to it, the homeowners enjoy a true Zen experience crossing the still pond to their own private island. For extended moments of contemplation, two Adirondack chairs have been placed there. The wide arms of the chairs allow for a small lunch and cool drink while they listen to birds and watch koi swim. With a dramatic waterfall focal point, surrounded by robust bright plantings, including gorgeous aquatic plants, it’s a delightful escape for relaxation. And whenever they, or family/guests wish, they can enjoy the experience of swimming in the pond. A truly awesome experience, much like swimming in a lake, swimming hole, or even the ocean. This photo of the smaller pond at sunset was a hit on our social media last week and inspired us to write about the whole Shoreham, NY project. The view from the homeowners Bullfrog Spa is awesome in all directions. Pictured here is the view looking right, at the larger vanishing edge swimming pond, with waterfalls and stone island. 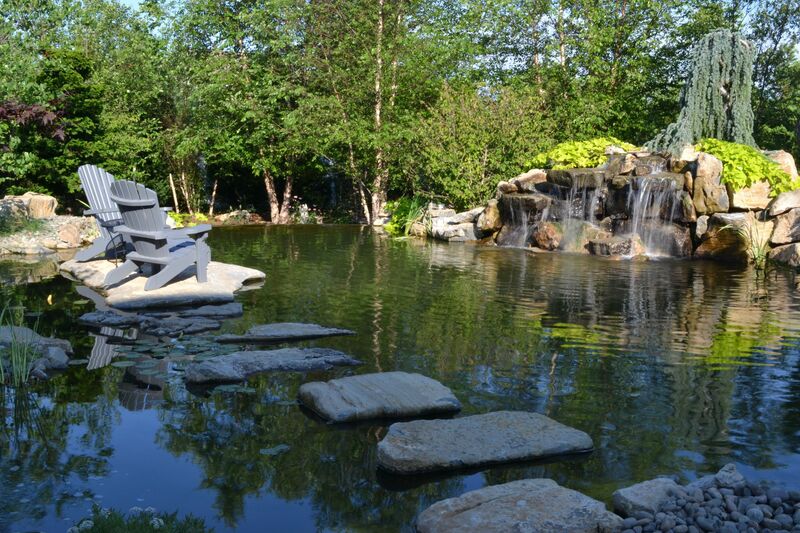 Here’s a close-up of the smaller pond’s waterfall (looking left from the hot tub). 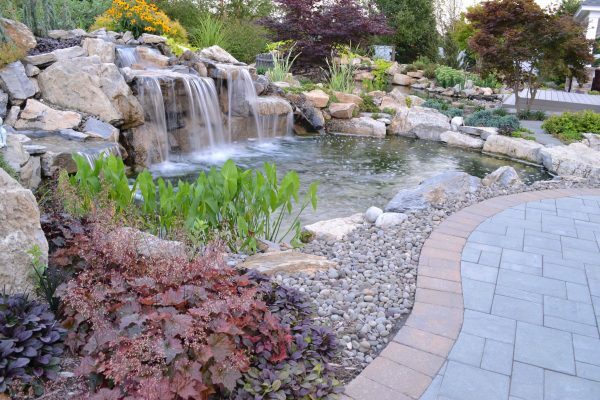 The two ponds and waterfalls are fed by this delightful stream, which Deck and Patio landscaped with beautiful plantings and river rock. Day or night, this backyard retreat is where our clients want to be. 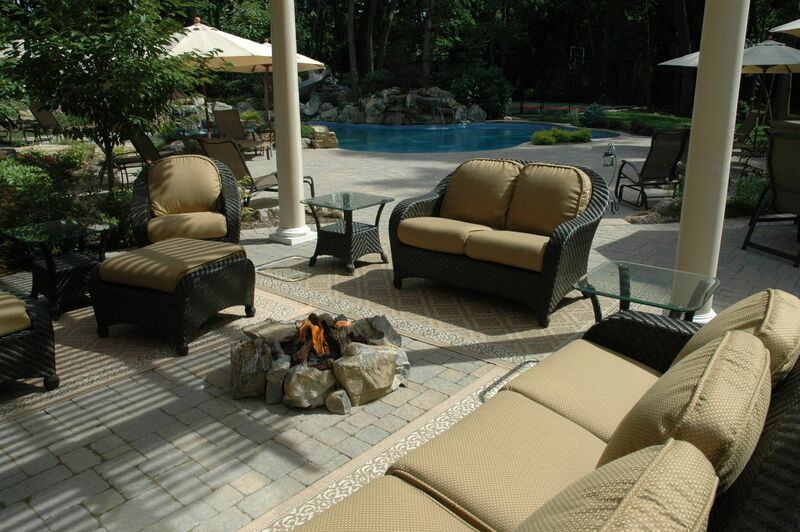 Here, in Long Island, NY, we are passionate about outdoor living. And for many, there’s no better way to enjoy al fresco living than under the shade of a handsome pavilion or gazebo. Open to breezes and the scents of blooming flowers, but shut to the sky’s burning rays or drizzling rain, these structures offer both shelter and aesthetic appeal. 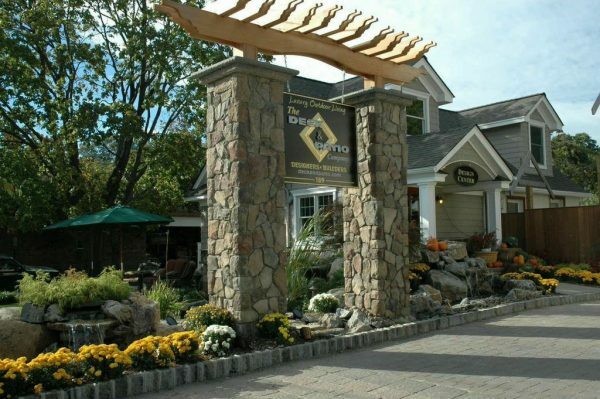 A large variety of designs permit individual architectural statements in any yard. 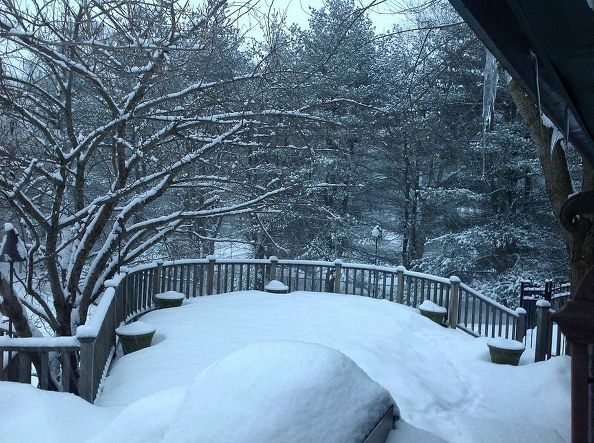 “The winter has been moderate so far this year,” says our own Dave Stockwell. “So Deck and Patio has been able to continue our outdoor living projects without stopping. In addition, the clients won’t have to rely only on the fireplace for warmth. Because of modern technology, Deck and Patio is able to add built-in heating to the pavilion, that with a flip of a switch, will warm up the interior. The overall backyard project will also include a new gunite pool and sumptuous landscaping. 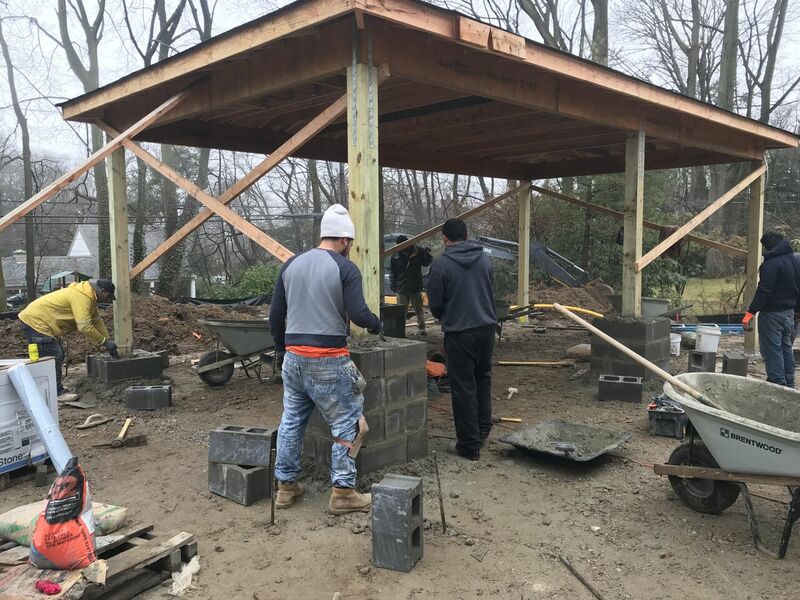 When this Manhasset outdoor living project including pavilion is complete, we’ll showcase it here in our blog. 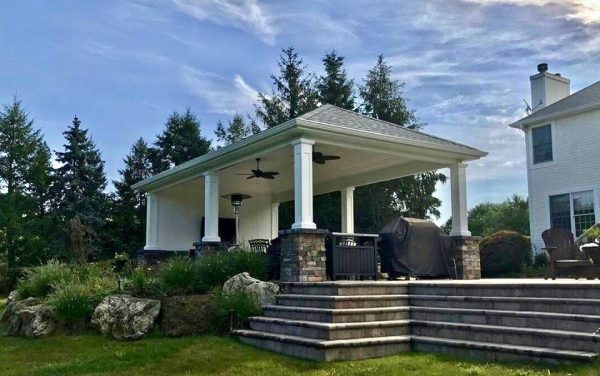 In the meantime, below is a small sampling of Deck and Patio pavilions/gazebos that we’ve built on Long Island — finished projects — that highlight the grandeur pavilions/gazebos offer any yard — par excellence. This pergola/pavilion with fireplace project was installed at the edge of a patio that also boasts a hot tub. Note how the handsome lighted columns on stone pillars of the pavilion match those of the fireplace. The lighting on the pillars and inside the roof contribute to a perfect evening ambience. 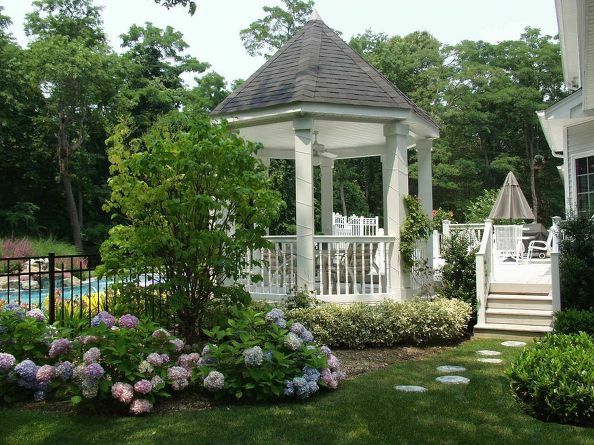 Some clients’ taste for outdoor space includes a romantic statement such as this lovely gazebo and harmonizing deck. 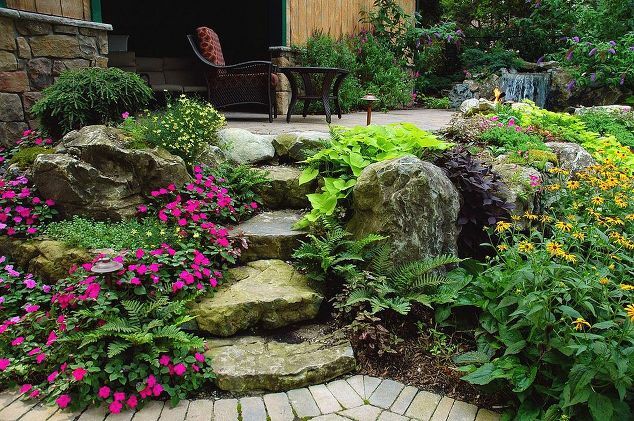 Bright plantings surround the area and a charming stepping stone path adds additional appeal. Notice how there’s little doubt that these inhabitants like to entertain. One can easily imagine this as the perfect spot at any time — but it’s especially well designed for inviting over friends and family. Many of us in the northeast retreat very reluctantly to a winter spent indoors. We make every effort to extend the outdoor season with the addition of fire pits, outdoor fireplaces, hot tubs, some even adding a four-season room. So its natural that when we see the first leaf turn from green to crimson high in a backyard tree, we know we’re heading into the last outdoor living sprint. The subject today is: how can we make this precious outdoor living time richly colorful for the maximum enjoyment? One way to make the outdoors inviting is by displaying some of fall’s bounty: gorgeous plants, fruits, vegetables and even berries — all perfect for decorating yards and front door entries. It’s also important to add compost to these plants so they get plenty of food while they are blooming, says Dave. Believe it or not, the pumpkin is not a vegetable — it’s a fruit, and a berry at that. 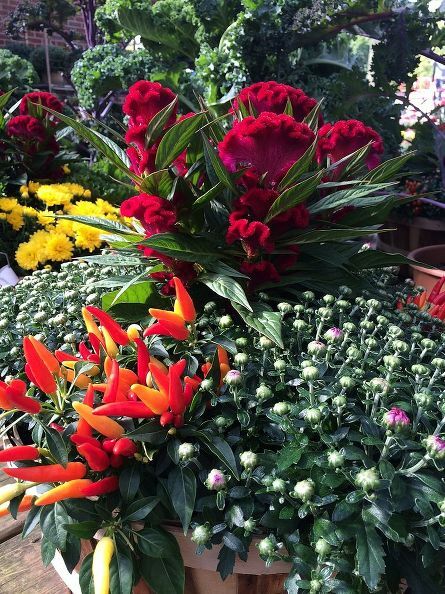 Along with hardy mums in bright yellow, etc., at Deck and Patio’s design center in Huntington Station we love displaying lots of these fall ‘berries’ for pops of bright orange. 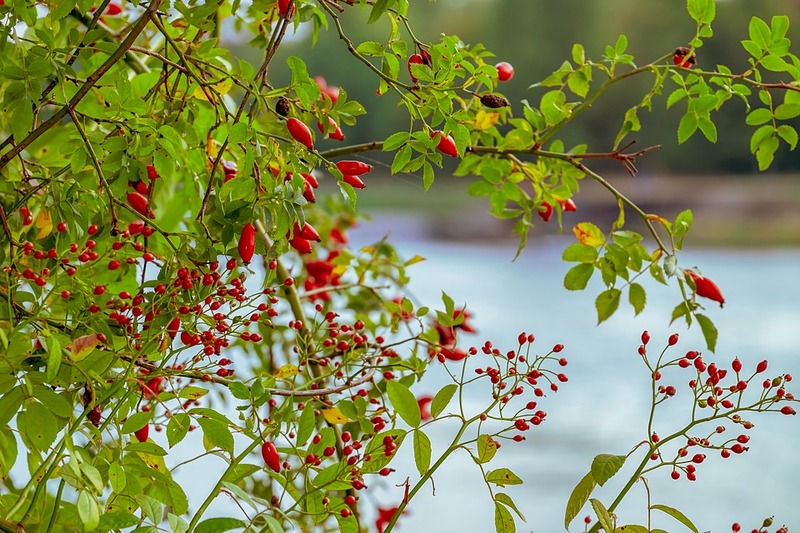 Rosehips come from plants also known as Autumn Wild Rose. They can enhance any autumn landscape. Note: Since they can take three years to grow from seeds, you’ll probably want to transplant a grown bush. This is done during the dormant season — sometime between November through February. This beautiful plant is a wildflower with bright red fruit hips that ripen in fall — and stay around through winter. The rose hips grow as the petals of the summer flowers drop off. These hips contain the seeds of the rose. Prune the bushes down to the ground in winter and then wait. When the temperature warms again in spring, they begin to regrow. By summer, you have wild roses, and in fall, you get the rose hips again. When we recommend a great plant for fall color, we emphasize ones that are interesting throughout the year. 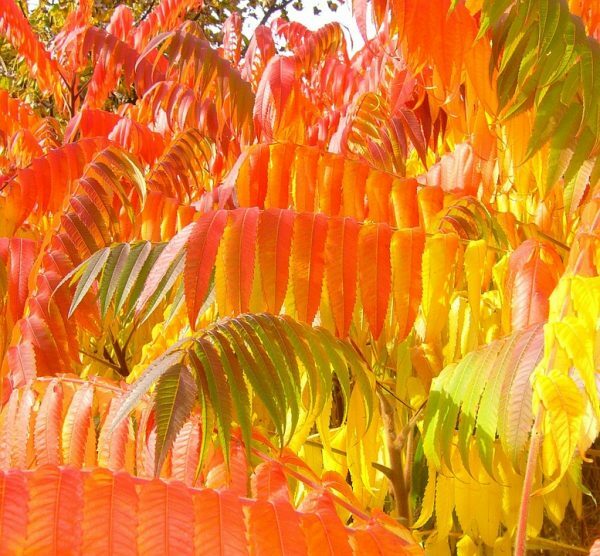 With Sumac shrubs and trees, their displays begin with large flower clusters in spring, gorgeously colored fall foliage (as seen here) with berries that can last into winter. Any well-drained soil works for this adaptable plant. It can take full sun or partial shade. 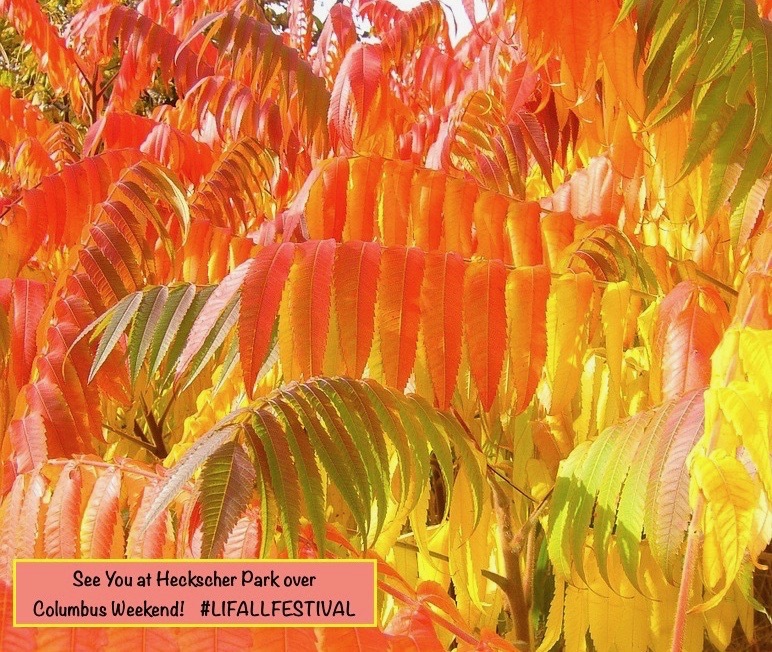 Note: for the most dramatic fall colors, the flame leaf or prairie sumac have the best flowers and color when planted in full sun. Outdoor rooms don’t have to be elaborate affairs. Some may not require any construction at all. Take the following Deck and Patio projects. Each one is designed to create the look and feeling of an outdoor room — yet, without constructing any walls. In all cases, comfort and beauty in the design add to their appealing atmosphere. And with no walls at all, breathing free is guaranteed. Adding only a handsome pergola and comfortable furniture, this backyard space has plenty of breathing room. 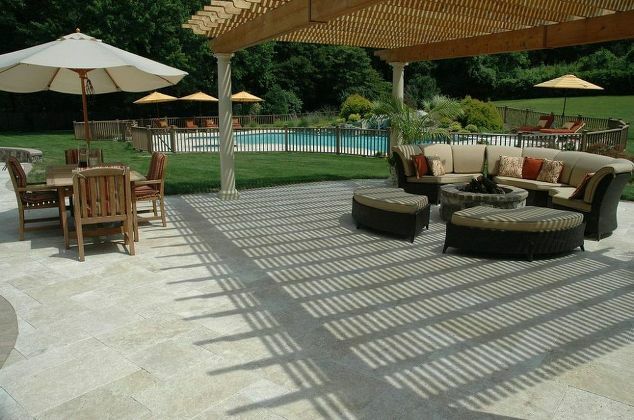 The elegance and size of the Travertine patio provided the perfect floor for a comfortable outdoor living room. Note how the pergola’s overhead slats create a shadow carpet that helps define the sense of an elegant outdoor living room. Along with the adjacent dining area, it is only steps from an outdoor kitchen/bar/barbecue, veneered in natural stone (see immediately below). Travertine Patio/Outdoor Kitchen: Close to the outdoor living room and dining area is the client’s bar/barbecue. With a natural stone veneer, an semi-circular seat wall with the same veneer offers extra seating when entertaining. If you want to enjoy your outdoor space into the evening hours you also have to think about lighting. One way to handle this is with a closed roof. This shingle-roof pergola/pavilion with fireplace project was installed at the edge of a patio. Lighted handsome columns on stone pillars match the fireplace. The lighting on the pillars and inside the roof contribute to a perfect evening ambience. Along with a hot tub set into a new multi-level deck, all the homeowners needed to have room to breathe was a fire pit and a television — no additional structure was required. Note: Today’s LED televisions can be properly encased to be theft-free. Encasing the television carefully will also ensure the proper internal temperature control/circulation to protect it. There are also televisions designed for outside use which resist rain, dust and other elements. In the end, perhaps you don’t want any fixed structure at all. These Deck and Patio clients opted to shade a self-supporting hammock with a tilt umbrella. They postponed them next to their pool’s waterfall — creating perfect breathing room space when the Purple Allijm are in bloom (forefront). Yet, this outdoor room is also moveable. 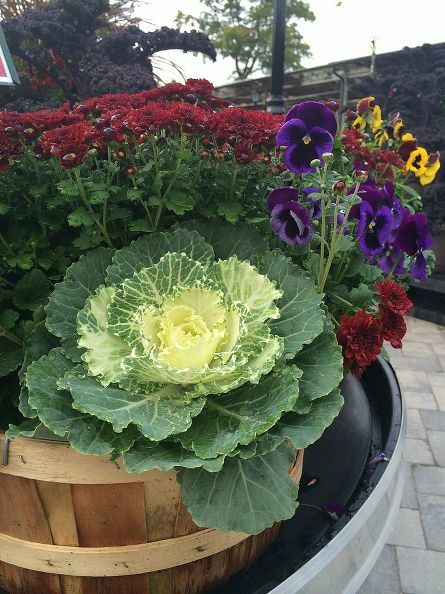 It can be relocated to a different landscaped spot when other seasonal plantings make attractive focal points. 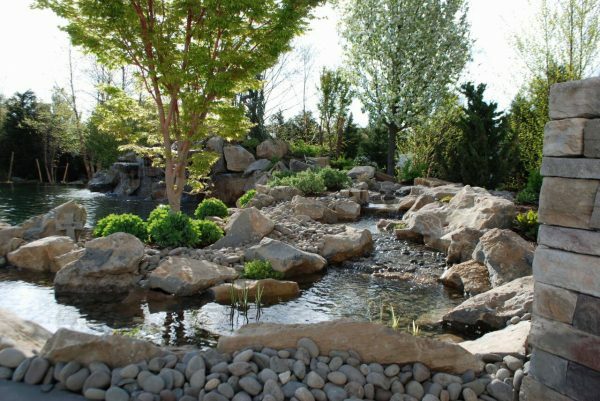 Of course, you don’t need a pool or waterfalls for a tranquil place to refresh the spirit. A container garden can be grouped with seasonal flowers and you have the perfect place to rest — with all the outdoor breathing room you could ever need. In days of yore, when family members had to travel to hunt for food, etc., candles in the windows and village campfires were welcoming signs that led them home. And it’s no different today. Home fires still beckon family and friends to gather round a warm blaze. Of course, in this millennium we can get a bit more sophisticated with our home fires than our ancestors. Modern fire features are stylish, designed to harmonize with their immediate surroundings. 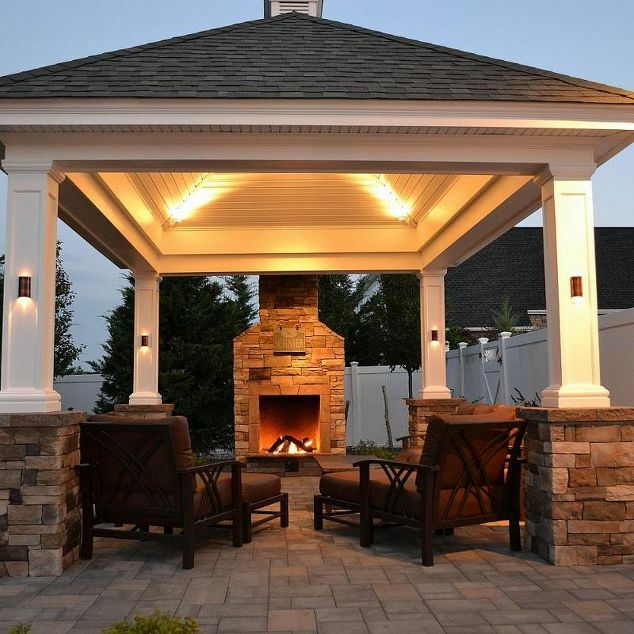 Choices vary widely: e.g., pre-made fire pit tables, custom fire features that are set-in-stone, easy-to-move portable campfires, cast iron fire pits, and dramatic custom or pre-fabricated fireplaces. 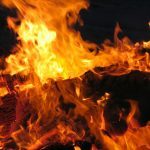 “The size and complexity of any fire feature depends on how you plan to use it, and the amount of outdoor space that requires warmth to extend the outdoor season,” says Bill Renter of Deck and Patio. 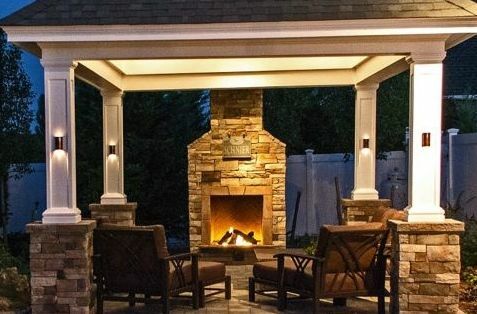 In the end, style, size and fuel remain very personal choices — as you will see from the variety of Deck and Patio fire feature projects we’re showcasing today. HOWEVER! 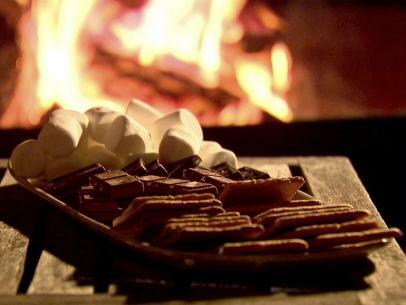 There is one thing all fire features have in common: s’mores frequently are involved. Frankly, if the warm glow of fire features aren’t sufficient to beckon friends and family, warm gooey marshmallows with melting chocolate definitely will. 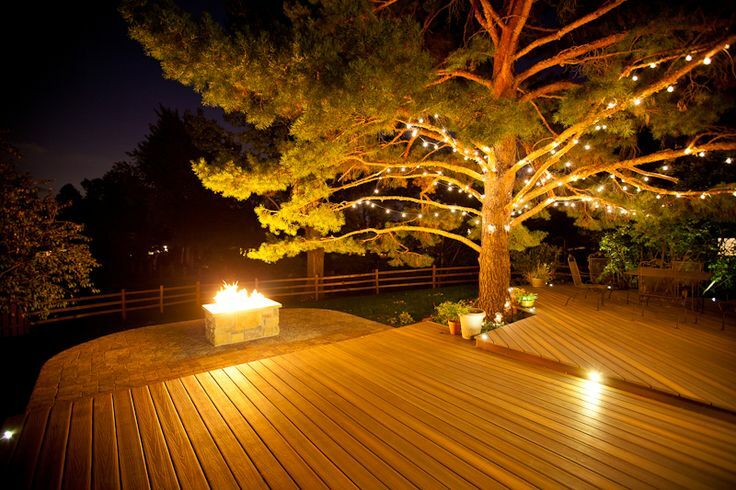 So enjoy some of our Deck and Patio projects with fire features (below). And because we treasure our readers, we follow these with a s’mores recipe from no one other than Long Island’s own Ina Garten — the Hampton’s Barefoot Contessa. YUM! Like many of our clients, these family members are true outdoor enthusiasts. In addition to a beautiful pool with spillover spa and natural-looking waterfalls, the homeowners had room for an expansive patio with several areas designed for different uses. 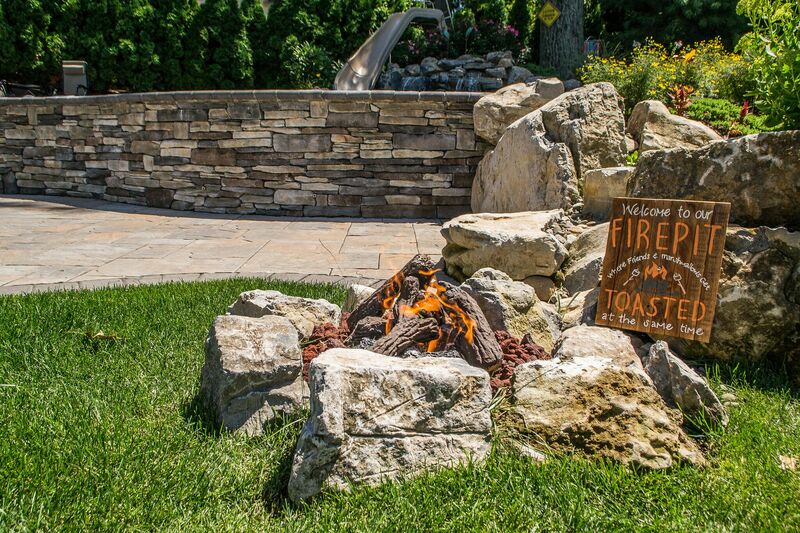 For their inviting seating area, they wanted a gas fire pit surrounded with natural rock that complemented the natural look of their pool’s waterfalls. Throughout this enticing outdoor living area, Deck and Patio emphasized earth’s natural elements such as wood, stone, fire and water. A backyard stream with waterfalls, surrounded by moss rock boulders, moves past a portable hot tub set against a two-level patio with fire pit. The patio was made from Techo-Bloc “Borealis” modular slabs that allowed us to give the patio the rich look of wood flooring. 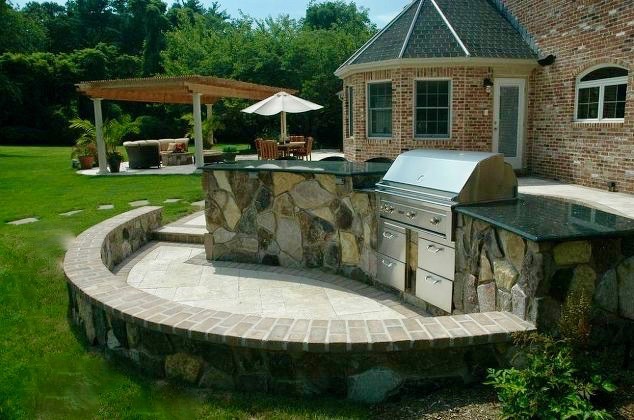 The fire pit was faced with stone for its handsome natural appeal. 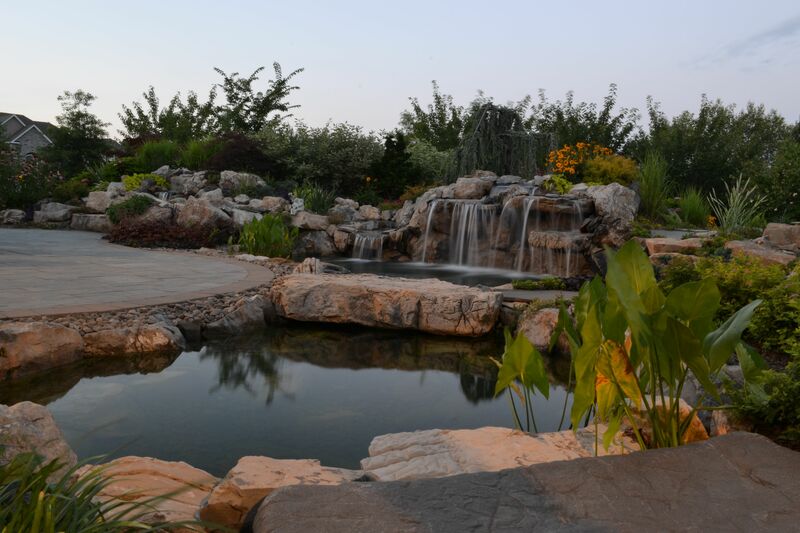 Because of the five different patio levels we created around their pool with cascading waterfalls, a hot waterfall into a new spa, then a spillover from the spa five feet above the main pool, plus diving rock, natural stone was featured throughout the yard. Because the various gathering area, warmth was needed in a variety of places. Again, natural stone was used to make natural gas campfires fit their surroundings. Sometimes clients want to burn wood or coals in their fire pits. 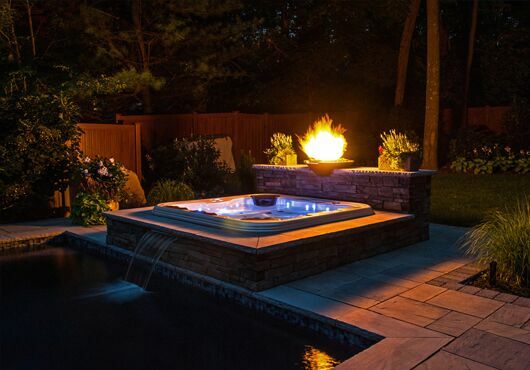 This handsome cast iron fire pit warms not only the deck seating area but also those sitting in the hot tub. It fits perfectly with a natural wood deck. Sometimes Deck and Patio’s fire pits go a bit larger — and become a whole fireplace. This is because clients occasionally want a stronger architectural statement as well as the fire. Set beside a lovely shingle-roof gazebo/pergola, this fireplace offers warmth in autumn and winter months and creates a perfect ambience. 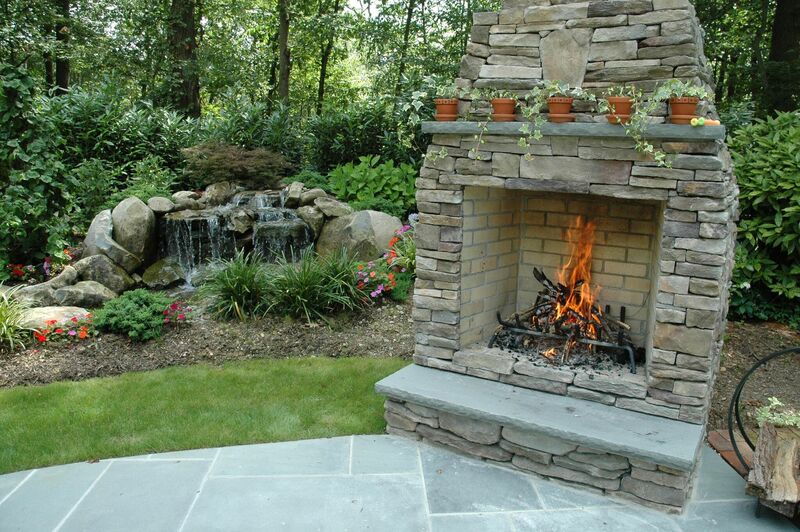 At one edge of their patio, a beautiful wood-burning stone fireplace with mantel beautifully harmonizes with the stones surrounding an adjacent pondless waterfall. A blazing fire makes you want to gather round, doesn’t it. Especially when the properties are small, Deck and Patio tends to push pools off to one side and leave lawn area for the children to play or just to have some “softscape.” In this case, such planning allowed the homeowners a nice spot for a much-desired outdoor campfire. The campfire we added uses propane stainless steel burner with moss rock boulders around it and outdoor fireplace logs. Note the amusing s’more’s sign the homeowners put behind their campfire. This leads us to the promised Ina Garten recipe for S’mores. Enjoy! Thread a marshmallow onto a stick or skewer and toast it over an open flame. Sandwich the cooked marshmallow with a piece of chocolate between 2 crackers. 2012, © Ina Garten, All Rights Reserved. When outdoor space is at a premium, small-scale patios may be a necessity. And in a recent post “Living Large on Small Patios,” HGTV online showed how top designers can make compact patios enticing. In addition to the two-level patio, for this project our clients opted for a water feature that could be enjoyed from wherever they were in their yard. 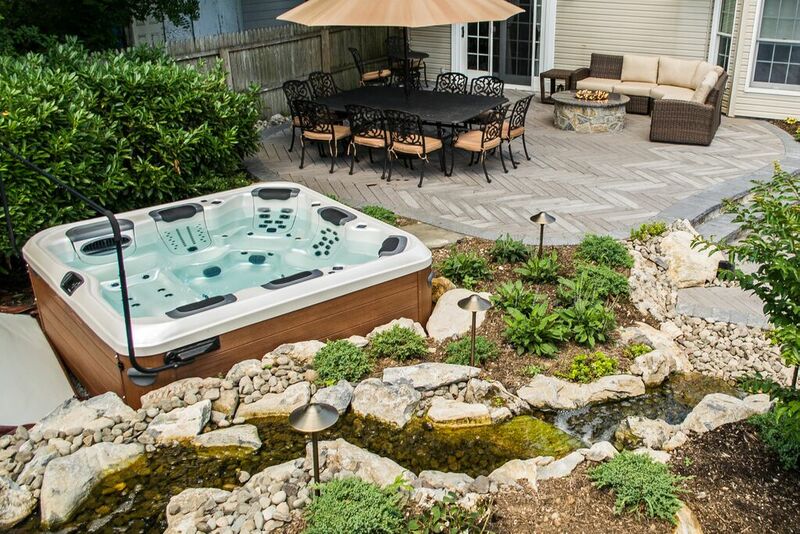 The stream with waterfalls, running alongside a new hot tub, became an attractive and soothing focal point when sitting on the small upper-patio. It is easy to see how the Techo-Bloc Borealis’ pavers (modular 5” and 10” wide slabs) were used to great effect in creating such an inviting space. Often called tromp l’oeil by industry professionals, the slabs allowed us to give the patio the rich look of wood flooring. With the addition of some attractive outdoor furniture and fire pit, the clients have a relaxing and beautiful small-scale outdoor room. The lower level of this patio was made of the same Borealis’ modular slabs as the upper area. Space being also at a premium here, the clients decided against a fixed pergola for shade, opting instead for more flexible outdoor umbrellas. These colorful umbrellas offer bright pops of color and can be set wherever they are needed, open or closed, depending on how much sun there is. 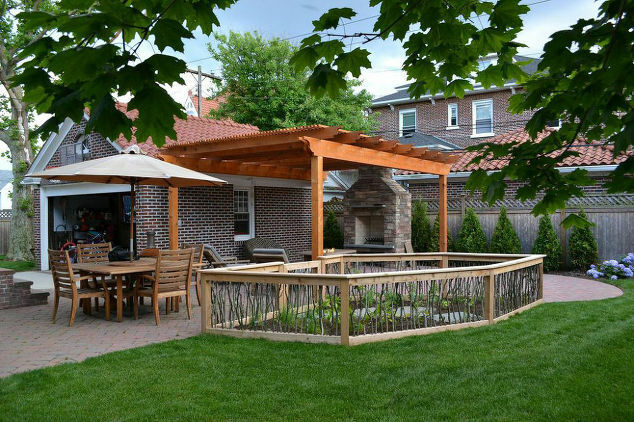 Despite having a small area for their new one-level patio, and in addition to a large outdoor umbrella for shade, these clients did opt for a pergola, which can be enjoyed for its architectural interest alone. Of course, the pergola also offers shade during the hot sunshine of summer, as well as privacy. It also harmonizes well with the Cambridge “Renaissance” 6 x 9 Ruby Onyx pavers they chose for the patio. In addition to a fireplace and fire pit, the clients wanted a fence that would keep their dog out of their garden. After cutting down a large bush in their yard, we used the leftover twigs to create a 2.5-foot fence with a gate. 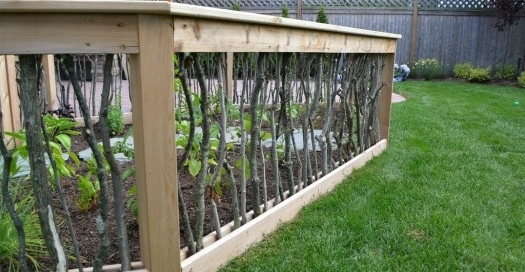 This fence not only protects the garden but provides an interesting focal point in the yard. Indeed, with a garden adjacent to their dining area, if they want some fresh herbs to dress their salads or spice up their barbecue, they can simply open the gate and snip! Note how we included handsome bluestone stepping stones inside the gate for doing just that. Sometimes limited space isn’t the impetus for creating small wonder patios. The inspiration can stem from the desire for intimacy, quiet, or privacy that only a small-scale design can offer. Such is the case with this charming space, which is one of 5 levels of a much larger patio. Pictured are moss rock stairs leading to it from one of the lower levels. Beautiful landscaping and a waterfall add to the tranquility of this secluded corner of their backyard, but it is its small size that truly makes it feel like an exquisite private escape. Had you ever thought of building a small patio just for writing or reading? If you had, perhaps it would look something like this delightful space designed and built by Deck and Patio. It was constructed with Techo-Bloc pavers next to a new water feature we added. Sitting beside the trickling stream, hearing the sounds of gentle waterfalls — far away from any other outdoor activities — provides an idyllic spot to read or just meditate. We’d like to think that HGTV would have included in their post this small Deck and Patio patio had they known about it. 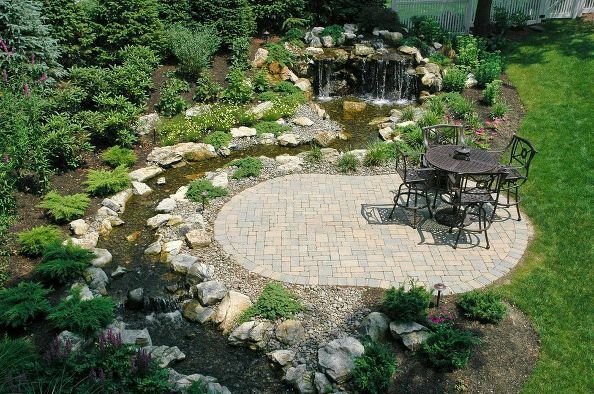 Its landscaping décor would make any decorator’s heart sing. With large trees on the distant periphery, simple container gardening allows the homeowners to move lush colorful plants wherever the activities are taking place. By not making the containers too heavy, this is an easy thing to do. Note, it also has an easy to move simple barbecue, as well as elegant, but easy-to-lift, outdoor furniture. Outdoor rooms can be elaborate affairs. 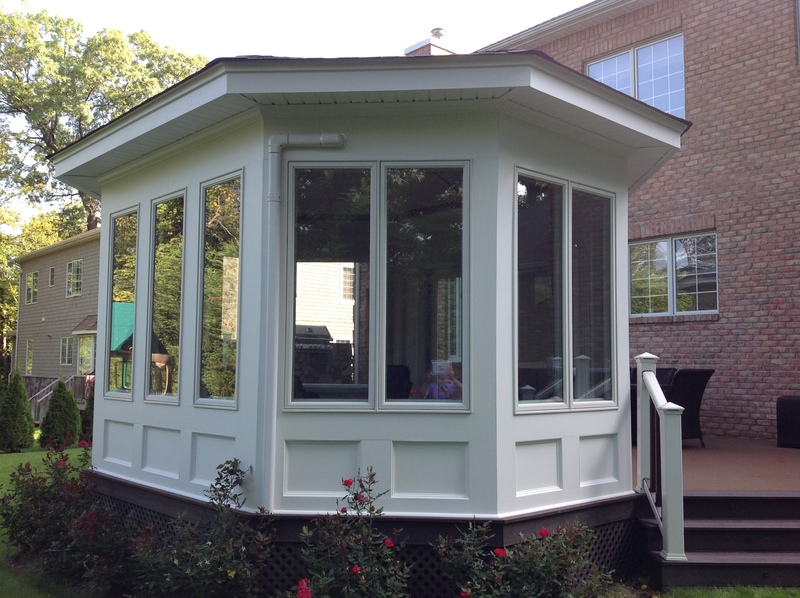 Indeed, one project we are showcasing today is an enclosed pool house that boasts two separate outdoor rooms. Still another is a completely enclosed four seasons room. But as This Old House Magazine recently showed in 39 DIY Budget-wise Ways to Create Outdoor Rooms, just about any outdoor space can be turned into an open-air living room offering room to breathe. The key is comfort. Just as indoors, outdoor rooms are for spending time relaxing with friends and family or just taking time to refresh your own spirit. And as long as you’ve created a cozy atmosphere, you not only don’t need walls around the space — you don’t even need a roof. In the end, the only rules for an outdoor room is to breathe fresh air. Once you consider your budget, ask yourself: How do I want to use the space? Am I looking for lots of nighttime enjoyment, including protection from mosquitos? How many seasons is it for? Who will use it the most in the family? Is it intended to be a swimming pool or other water feature amenity? Here’s how some of our clients answered those questions, and how Deck and Patio helped them fulfill their plans. The Ultimate: Pool House with Outdoor Rooms. This completed project won Deck and Patio a prestigious international APSP award. Along with a pool with waterfalls and spillover spa, elegant Travertine patio/pool surround, outdoor kitchen with natural stone facade (unseen), and outdoor shower, we built them a stunning pool house with “two” separate outdoor rooms. The pool is located far from the house and they wanted the ability to cook by the pool, as well as have a place to relax — bug free. The 800-square-foot pool house includes a 20-by-20 screened room and bathroom, as well as separate great room with sofa, flat screen television, refrigerator, washer/dryer, and storage closet. 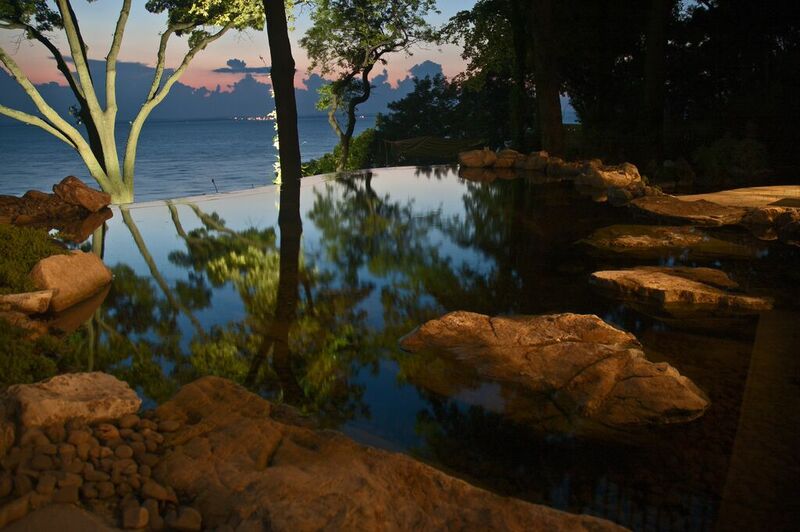 At night, this destination pool area (see also photo above) is as romantic as it is serene. It is an idyllic spot for parties that begin in the day and continue long into the night. After an evening of being pestered by insects, these clients decided they wanted their outdoor room “screened.” Later, when they decided to use it when it was windy as well as in the cold months, the screens became windows. And once it was to be fully closed in, opportunities for more special amenities opened up. The completed four seasons room not only harmonizes with their home, as well as having screens, it boasts fully operating windows, automated Mitsubishi ductless heating and air conditioning, a flat screen television, and enough room for their young child to use his ride-on toys. No matter the season, this outdoor room’s large Anderson windows offer a 360-degree view of their lovely property. Not all outdoor rooms require walls. Using only a handsome pergola and comfortable furniture, this backyard space has plenty of breathing room. Note how the pergola’s overhead slats create a shadow-carpet that helps define an elegant outdoor living room. The adjacent dining area is only steps from an outdoor kitchen/bar/barbecue veneered in natural stone (see immediately below). The property’s glorious expansive Travertine patio serves as the floor for these happy spaces. Deck and Patio used a natural stone for the veneer of the bar/barbecue and constructed a seat wall made of the same veneer, with the same edge-restraint as the capstone for the seat wall. This created a unique contrast between the patio, bar area and the extensive back veneer used for the house. During the day, you have earth’s sun to provide all the light you need. 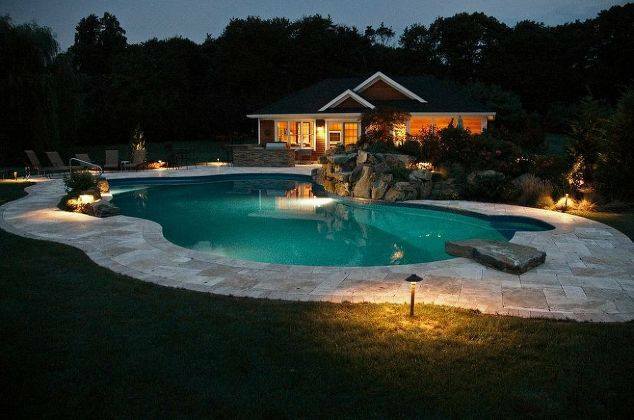 But, when it comes to an inviting outdoor room at night, lighting can greatly add to the experience. 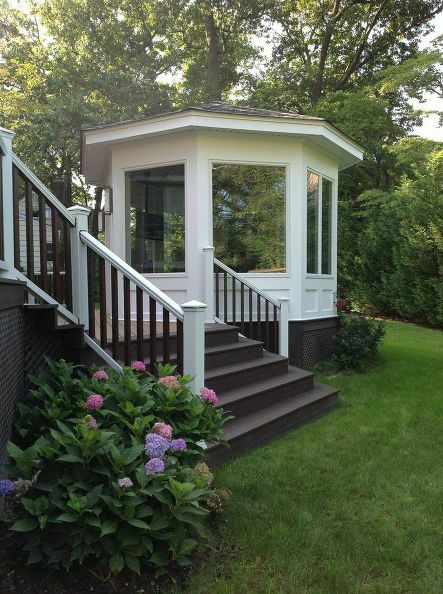 This shingle-roof pergola/pavilion/fireplace project was installed at the edge of a patio. With lighted handsome columns on stone pillars that match the fireplace, lighting creates the perfect evening ambience through several seasons. 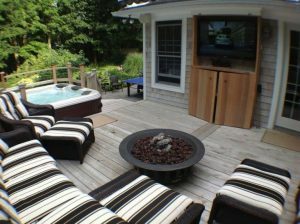 Along with a hot tub set into their multi-level deck, thee homeowners created room to breathe by adding comfortable furniture, a fire pit and a television. Note: Today’s LED televisions can be properly encased to be theft-free. 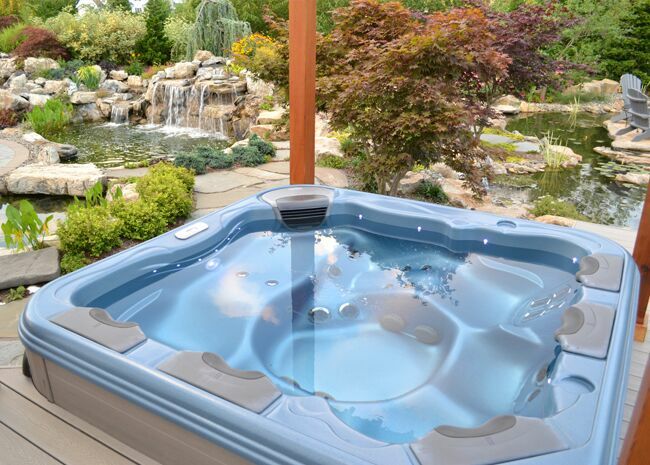 In fact, Best Hot Tubs’ outdoor living expert has helped clients do just that. Encasing the television carefully will also ensure the proper internal temperature control/circulation to protect it. There are also televisions designed for outside use which resist rain, dust and other elements. If you agree with This Old House Magazine’s feature mentioned above (and we do), maybe you don’t need anything fixed to create an idyllic outdoor living space. 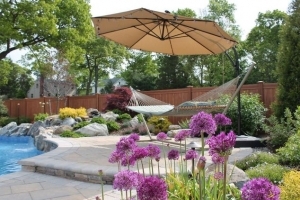 Here, to shade a self-supporting hammock, the clients positioned a tilt umbrella next to their pool’s delightful waterfall. It’s the perfect spot when the Purple Allium Sphaerocephalon are in bloom (forefront). 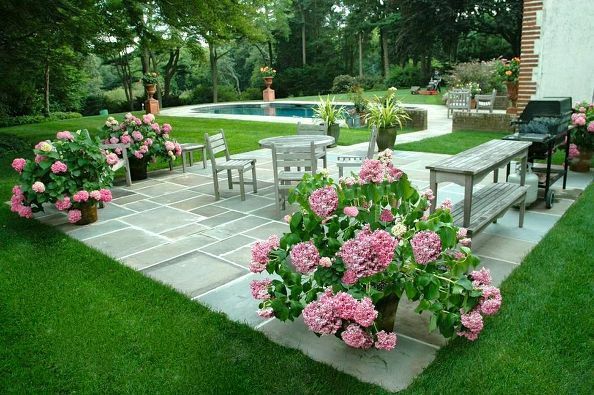 Yet this outdoor room can be moved to another spot when other plantings are relaxing focal points. And you don’t need a pool or waterfalls for a tranquil place to refresh the spirit. Create a container garden by grouping some seasonal flowers together and set up a place to rest — you’ll all the outdoor breathing room you need. “Enjoying my deck in winter?” you might be asking. Actually, yes! 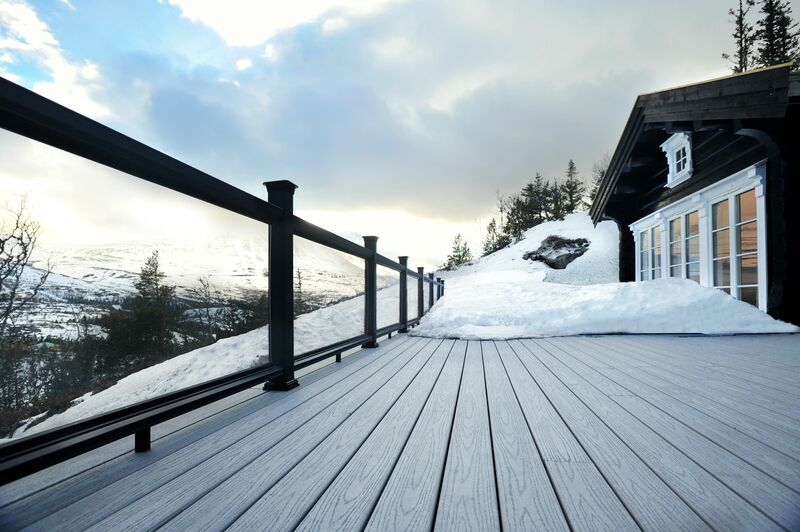 To get the snowdown on how to enjoy our decks even when it’s snowy outside, we spoke to Edie Kello, Director of Marketing Communications at a leading capped-composite decking manufacturer: Fiberon Decking. Kello says the most important aspect to outdoor winter enjoyment is to remove any existing snow. Kello does not recommend using sand to remove ice and snow because that can mar a deck’s surface; if the snow is light, a broom is a good choice or, again, a plastic shovel, Kello recommends sweeping the used rock salt into the trash, then rinsing the deck off to remove any residue. This is especially important if you have pets. Having a heat source, such as a deck heater (or patio heater), permits you to enjoy your winter wonderland and the fresh crisp air longer. Not to mention you can make s’mores and keep hot cider and hot chocolate warm. Available in building supply stores, they come free standing, fit on a table top, and usually run on propane gas. “These heaters will throw heat down and around where you are sitting,” says Kello. 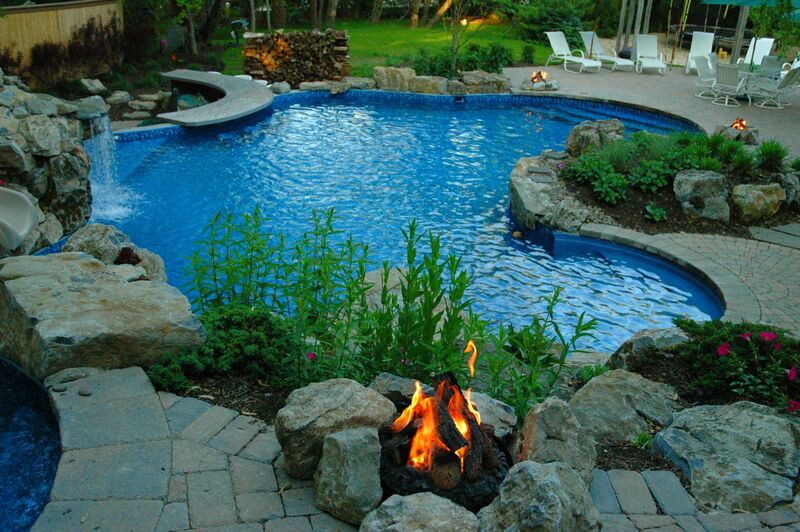 “Fire pits and fireplaces are other popular choices. 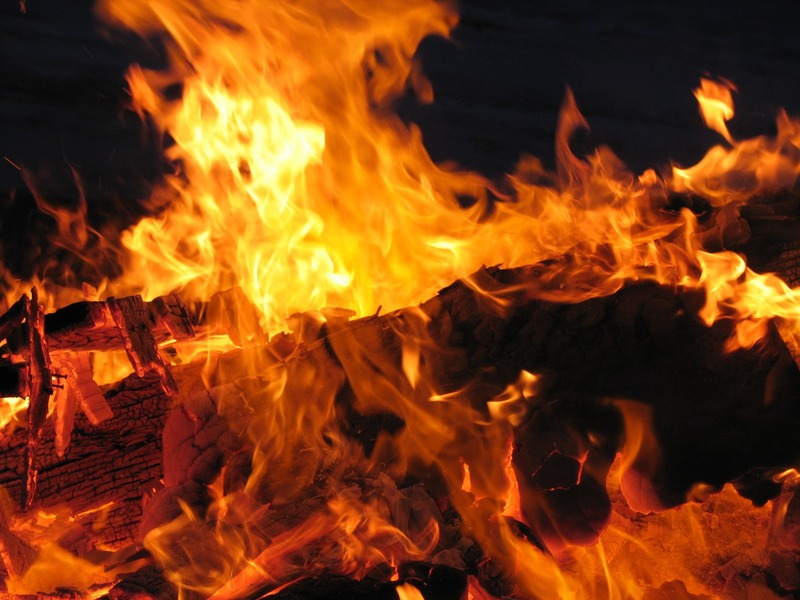 If you are not using a natural gas heat source, we recommend putting a fiber-cement mat (made of a mix of wood pulp and cement) underneath a fire pit to catch any embers. Since heat rises, Kello says you probably want some sort of deck covering that will help trap the heat. “It’s great if you can add a roof, but if you have a pergola, you can put a tarp or outdoor fabric over it, or add an awning. These options help keep harsh elements off the deck as well, so there’s less shoveling. If we go through the effort of keeping our decks clear of snow and add a source of warmth, that means we get to use our outdoor grills much longer into the winter season. 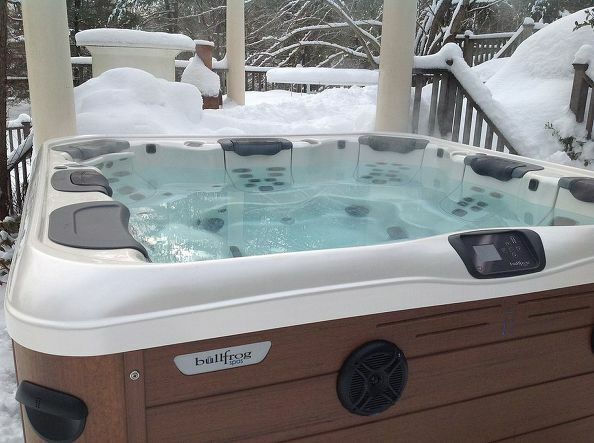 Additionally, some people install a hot tub to take full advantage of winter outdoor living — even when there is a massive amount of snow. Just be sure any hot tub is properly supported within the sub-structure of the deck, says Kello. add color and life on your deck by including flowers such as Pansies, Johnny Jump Ups, Cabbage and Kale, or perennials such ornamental grasses and lavender. “The point is, even when it snows, you really can enjoy the crisp fresh air right outside your door if you make it comfortable enough,” says Kello. 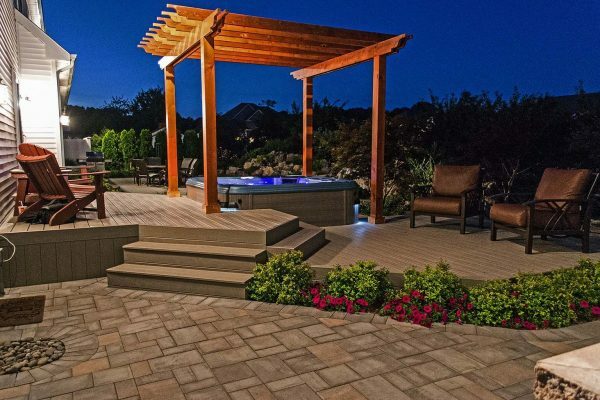 When considering to build a new, or upgrade an existing, pool, spa, hot tub, water feature, or landscaping, it is not unusual to search out companies who have been recognized for their expertise and talents through the winning of awards. 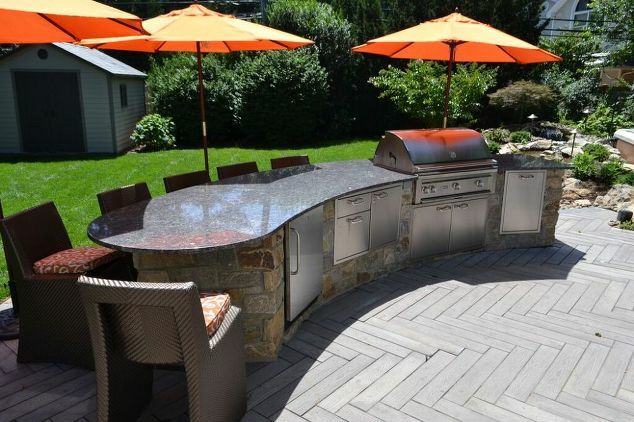 Deck and Patio Company’s outdoor living expert has written many articles on these subjects and is considered an expert in these fields by his peers and professional associations. He is particularly proud that year after year, his firm has earned special recognition for the firm’s design and construction excellence. And it is with great delight that we share today award honors for 2013 received from The Association of Pool & Spa Professionals (APSP). 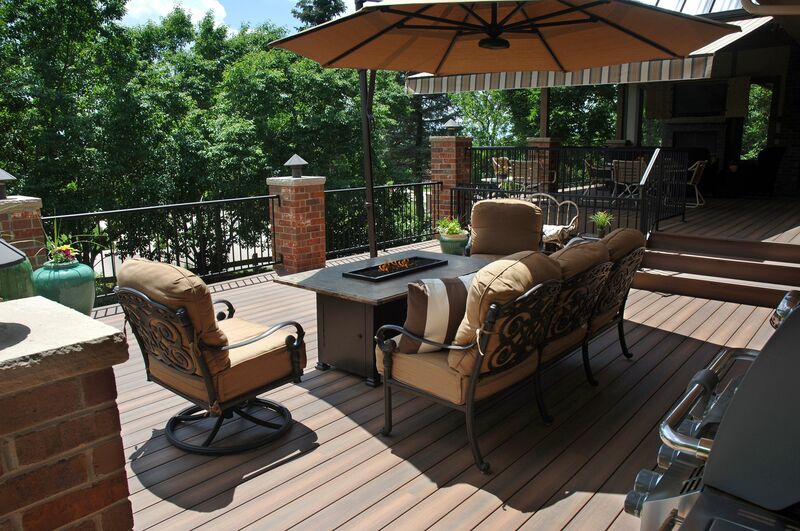 APSP’s 2013 Bronze awards (see APSP video immediately below) includes two awards for Deck and Patio. When Deck and Patio was restoring an existing pool and deck destroyed during super storm Sandy, the homeowners decided they wanted a “full water experience.” So beyond the wonderful dock/water access they already had on a Long Island canal, and the new upgraded pool and deck our outdoor living expert was designing and building for them, he also created a new spa/lounge area with a portable Bullfrog Spa. The new hot tub is located just steps down from the backdoor where it is set into the deck for a pleasing “built-in” appearance. The hot tub’s cover can be left upright to provide additional privacy and easily dropped down to cover the hot tub when not in use. 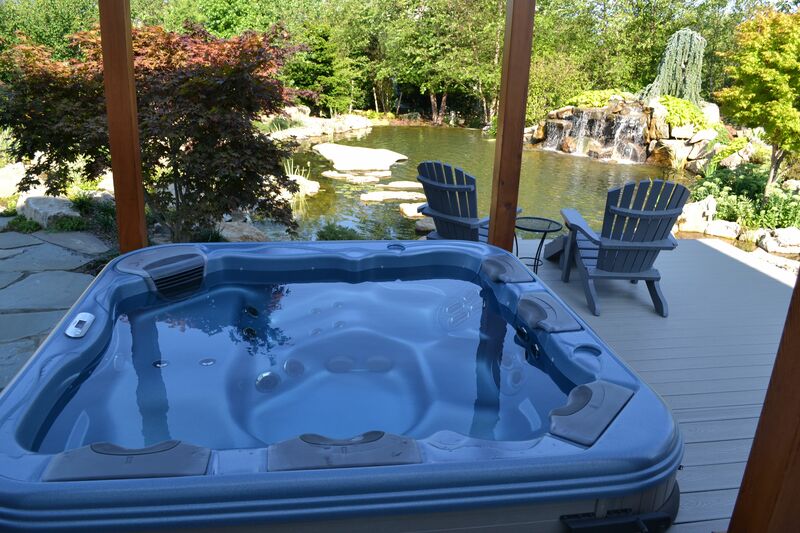 Special Note: Deck and Patio includes a hot tub cover with all its Bullfrog Spa packages. We feel this is important because when the wind blows and dirt and leaves fall, they throw off the balance of the water quality by affecting the sanitary conditions of the water. In addition, clients will use the cover more regularly if it’s easy to open and close and if it is attractive and suits their hot tub model. 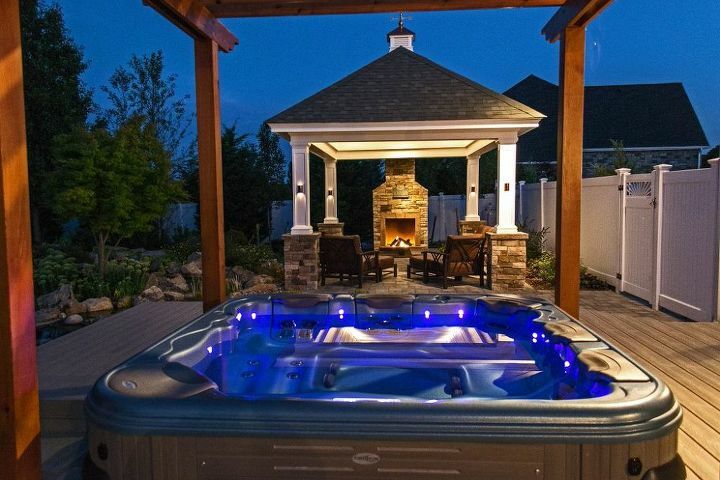 Such is the case for this hot tub’s cover which fits the hot tub’s size, design and where the homeowners wanted it placed. 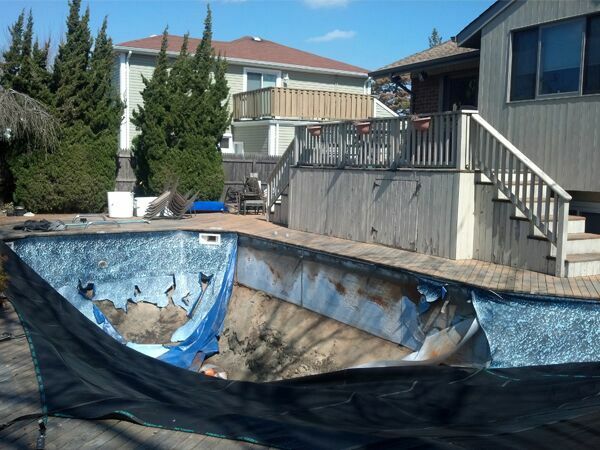 Deck and Patio’s outdoor living expert took a “before” photo of damaged pool and deck as it appeared after super storm Sandy. 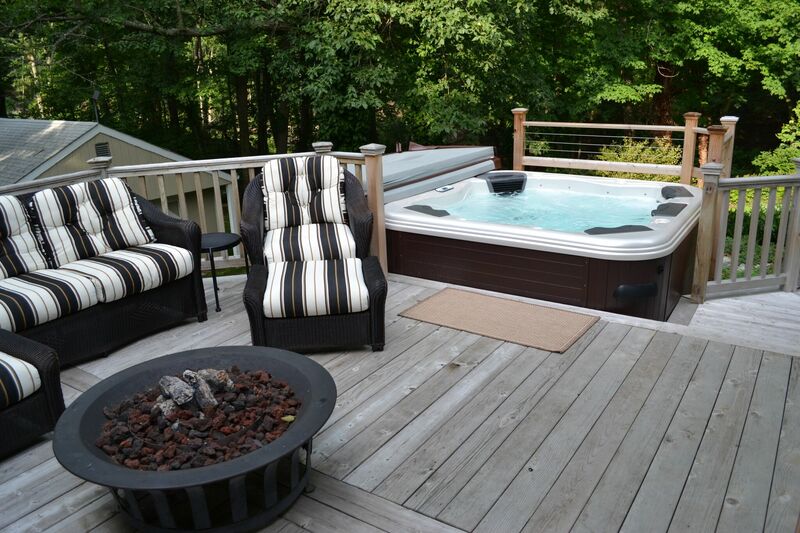 The project’s new hot tub, just steps down from the backdoor, has been set into the deck by Deck and Patio’s outdoor living expert for a pleasing “built-in” appearance. 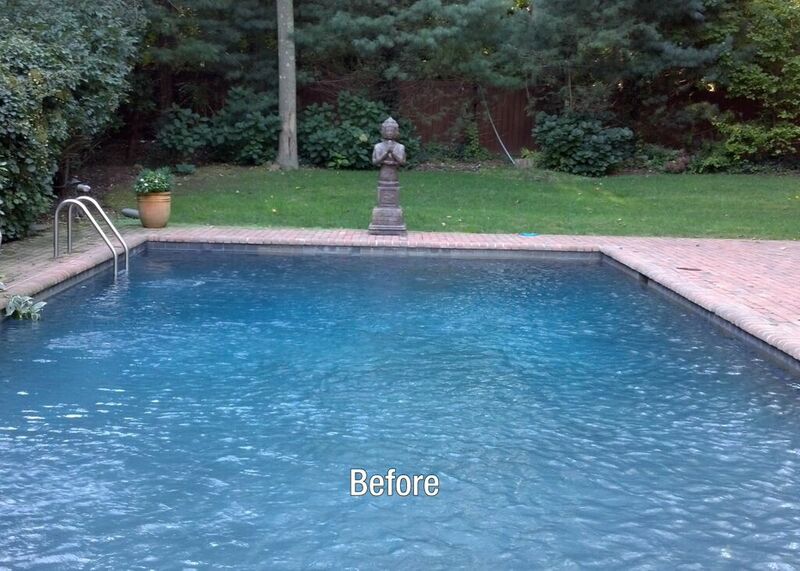 This pool renovation was part of a total reconstruction of the backyard. It included a complete revamping of the pool’s pipes, interior, finish and the incorporation of new swim outs at the deep end. 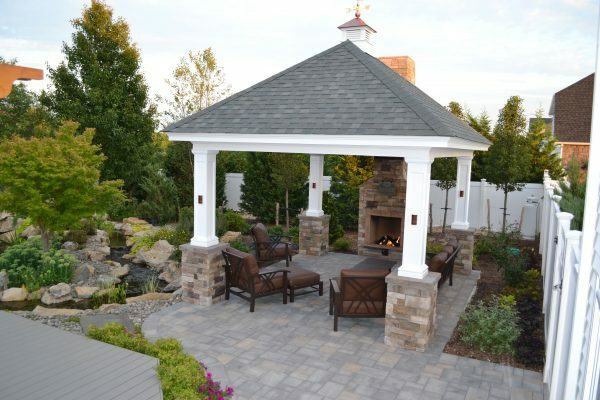 Deck and Patio’s outdoor living expert also built a new spa encasement with a stone facade on top of Techo Bloc patios. The spa included special plumbing. Deck and Patio also built a matching accent/privacy wall, with a fire bowl and water feature that spills water into the hot tub. The base of the spa also spills its water into the pool for a beautiful hot springs/Roman pool effect. At night, the scene is nothing short of glorious. Special Note: The feature’s “sheer descent” waterfalls provide a gentle rushing sound via an attractive glass-like sheet of water. The best part of these waterfalls is their ability to offer the audio and visual enjoyments of continuous flowing water, while using only a minimum of water flow. In the charming areas of landscaping around the spa, this natural softscape breaks up the surrounding hardscape areas with bursts of color and softness. 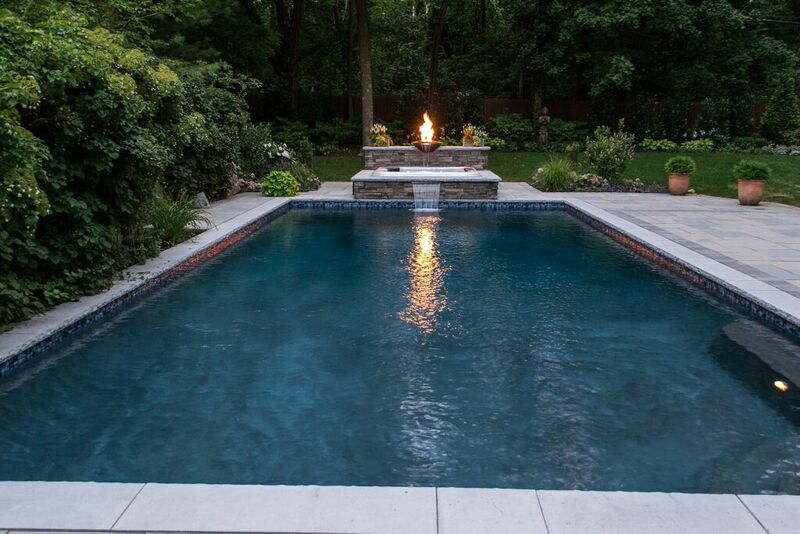 This pool renovation was part of a total reconstruction of the backyard. It included a complete revamping of the pool’s pipes, interior, finish and the incorporation of new swim outs at the deep end. In the charming areas of landscaping around the spa, Deck and Patio created a natural softscape that breaks up the surrounding hardscape with bursts of color and softness. With the fire bowl blazing and attractive hot tub LED lights shimmering, nighttime scenes for this project are nothing short of glorious. APSP’s 2013 Merit awards (see APSP video immediately below) includes two awards for Deck and Patio. In addition to a Bronze Award (see above first video), Deck and Patio won a second “Merit” award for the encasment of a portable spa in a stone facade on top of a Techo Bloc patio. Deck and Patio built a matching accent/privacy wall, with a fire bowl and water feature that spills water into the hot tub. The base of the spa also spills its water into the pool for a beautiful hot springs effect. Category: Hot Tubs, Spas, and Water Features: Exterior/Interior Portable Hot Tubs. 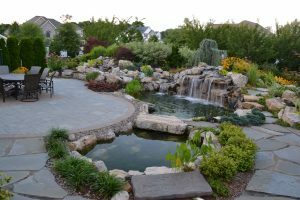 This project — with its elegant decking, gazebo/pergola with shingled roof and stately white columns, small pond, hot tub (underneath its own separate pergola), stepping stone bridge and paths, plus a second, larger, vanishing-edge pond with waterfall and connecting stream — was accomplished in three phases. 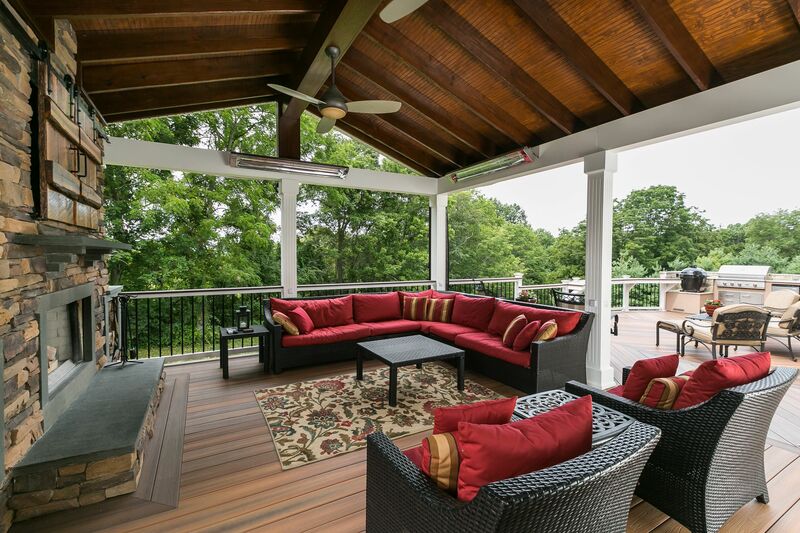 The beautiful new deck, hot tub, and pergola was Phase I of this special outdoor retreat. 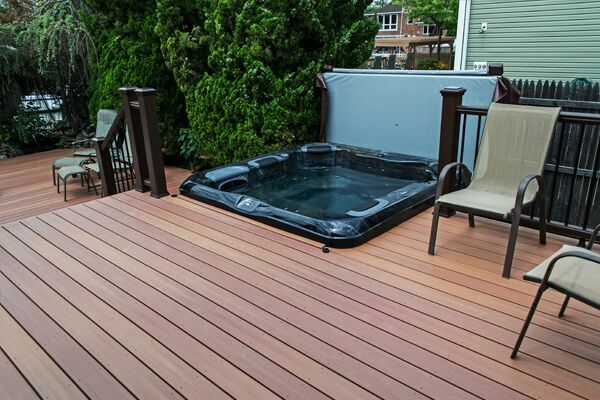 The hot tub case was carefully chosen to match the tone of the composite decking. Once the other phases were complete, they became stunning views to be enjoyed from lounge areas as well as when relaxing in the hot tub. At the edge of a patio, beside the project’s lovely shingle-roof gazebo/pergola, a fireplace not only offers warmth in autumn and winter months but it creates the perfect ambience while soaking in the hot tub as well providing a close-by comfortable lounge area when taking breaks from the spa waters. The hot tub case, underneath its own separate pergola, was carefully chosen by Deck and Patio’s outdoor living expert to match the tone of the composite decking. The adjacent gazebo/pergola and fireplace offer the perfect ambience when soaking in the hot tub as well as a comfortable lounge area for taking breaks from the spa waters. The hot tub merit award was one of two awards for the same project. A multi-faceted water feature for this backyard boasts a vanishing edge upper pond and lower pond, waterfalls, and a gentle stream — all of which can be enjoyed from the hot tub. Underneath this water feature, Deck and Patio’s outdoor living expert installed an extremely high tech and a complex natural biological filtration system that continuously maintains the feature’s crystal clear water. The vanishing edge upper pond is raised in front of a bluff. Water spills from it into a delightful connecting meandering stream down to the lower pond located at the side of the house. In autumn, leaves from the trees fall into the water and are pushed along the stream where they are caught in a bed of gravel and are easy to remove, like emptying a skimmer basket in a pool. Considering the energy efficient pumps, which only ramp up when the homeowners arrive home, as well as the fact that the system harvests rain water to help sustain its underground water reserve, it’s a project to delight the heart of any green enthusiast. While vanishing edge swimming pools are familiar projects on Long Island and nationally, only one other vanishing edge pond had ever been created in the United States before our outdoor living expert executed this award-winning vanishing-edge pond on Long Island (New York). 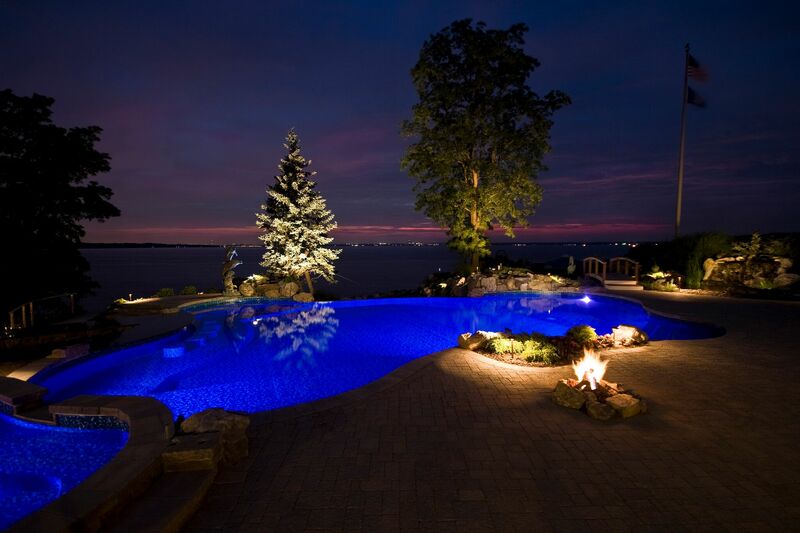 The vanishing edge upper pond rises to a bluff overlooking Long Island Sound; underneath its stillness, Deck and Patio’s outdoor living expert installed an extremely high tech and a complex natural biological filtration system that continuously maintains the feature’s crystal clear water. The vanishing edge upper pond is raised in front of a bluff; Deck and Patio designed its water to spill into a delightful connecting meandering stream down to the lower pond located at the side of the house. This project was an interesting one for us. Our clients’ Long Island, NY, home is part of a beach community where properties are close together, and where shade and privacy is at a premium. Our planned backyard upgrade included new amenities such as: patio, shade pergola, wood-burning fireplace, fire pit, attractive landscaping — and, a small herb/vegetable garden. The only problem was the homeowners feared the larger of their two dogs would trample any garden created. Some sort of fencing would be required, but would that detract from the limited natural space they had? Deck and Patio’s Outdoor Living Expert, Bill Renter, considered their concerns as work began. And when they were cutting down a large overgrown bush in the yard, a unique idea occurred to him. The result is the bush clippings didn’t end up at the dump, and, instead, were used to good effect. The custom pergola beautifully provides shaded areas in their backyard, as well as privacy around the sitting areas. Cool evening ocean breezes are eased by the fireplace and fire pit, and the couple has fresh herbs and vegetables already budding — unmolested. Note: Many will also wish to know that their cherished larger dog hasn’t gotten into any trouble — at least because of any harm to their garden. The project’s new shade pergola and fireplace offer privacy in this compact beach community; the new patio is made from Cambridge Renaissance 6 x 9 Ruby Onyx pavers. Deck and Patio used some unique materials to protect the newly created herb/vegetable garden. 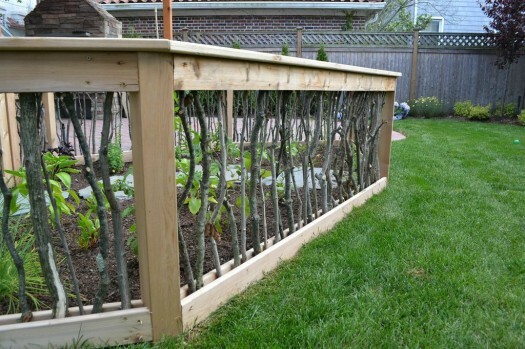 A 2.5-foot-high fence with gate was made from brush twigs; it not only protects the garden, but offers an interesting focal point to the yard. The garden fence made from cut down brush is completely custom and is a unique part of the backyard upgrade design. The new wood-burning fireplace in made in cultured stone: Country Ledgestone, in the color “Bucks County.” The fire pit table is “Snowbird” made with a stainless steel burner: its clear fire jewels appear to be bubbling when the flame is lit. 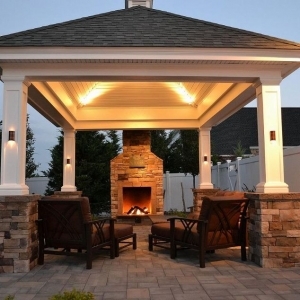 The custom shade pergola can be enjoyed for its beautiful architectural interest alone. However, it also offers privacy and shade during the intense heat and light of summer.